Drink D2 Day from DeLille Cellars - Write for Wine: It's Wine O'Clock Somewhere!Write for Wine: It's Wine O'Clock Somewhere! D2 has two meanings. D, of course, stands for DeLille Cellars, and 2 represents the second wine ever made by the winery. But the blend is also named after “the grand route du vin” or the great wine road that travels through the historic chateau region of Bordeaux. Always leading with Merlot, D2 is a traditional blend sourced from 15 of Washington state’s most prestigious vineyards in the Columbia Valley. For this 25th vintage, Merlot (59%) is blended with Cabernet Sauvignon (34%), Cabernet Franc (4%), Malbec (2%) and Petit Verdot (1%). 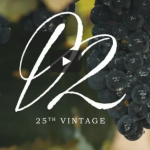 For more insight, DeLille offers an inside look at D2 with Executive Winemaker Chris Upchurch and Winemaker Jason Gorski, in a video called “A Word from The Winemakers.” Scroll down this page to have a look. 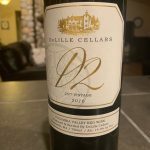 From Nov. 30-Dec. 2, DeLille Cellars also has an anniversary offer on the price of D2, so keep your eye on their website. And there’s a “Where do you D2?” photo contest for D2 fans. Simply take a bottle shot to show where you drink D2 – on vacation, at your favorite restaurant, in front of a cozy fire at home, or even the couch! More details about the contest, rules and where to submit your photo can been found here. So where are you going to D2? 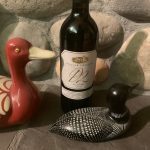 We’re going to open a bottle or two with some dear friends in front of a cozy fire, while watching the ducks on the lake swim by. Many thanks to DeLille for the sample of this exquisite wine. This entry was posted in Bordeaux Blend, Cabernet Franc, Cabernet Sauvignon, Columbia Valley, Malbec, Merlot, Petit Verdot, Washington, Wine, Woodinville and tagged Bordeaux blend, Cab Franc, Cabernet Sauvignon, D2, DeLille Cellars, Drink D2 Day, Malbec, Merlot, Petit Verdot, Washington wine, Washington wineries, wine, wineries, Woodinville by Margot. Bookmark the permalink.